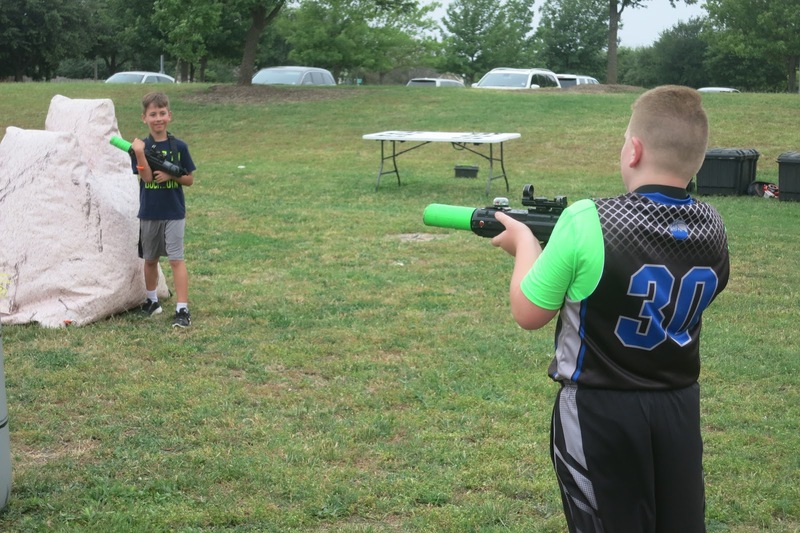 I absolutely love boy Birthday parties! Star Wars, Nerf guns, superheros, construction vehicles, ninjas, and now video games and laser tag! 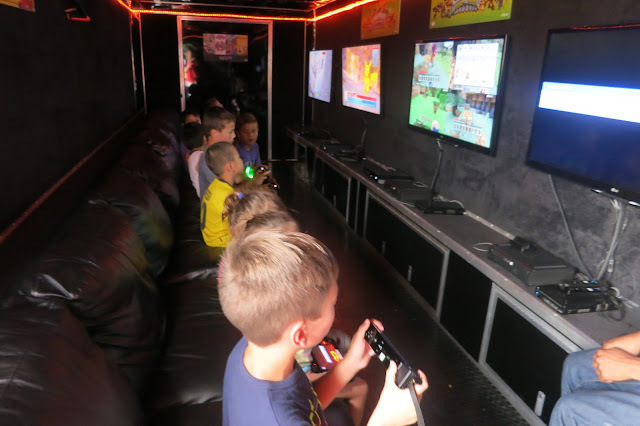 What better birthday is there for a bunch of eight and nine year old boys than a Game Truck?! If you have not heard of this, I will fill you in. This climate controlled truck with seating for about twenty will pull up to your home, park, or wherever they have fifty feet to park. The game truck host runs the whole show inside the truck. The company we used had six different screens with multiple gaming systems and over ninety age appropriate video games. Depending on your package, you can get at least an hour or more of unlimited gaming. The game host we had was very patient and friendly. 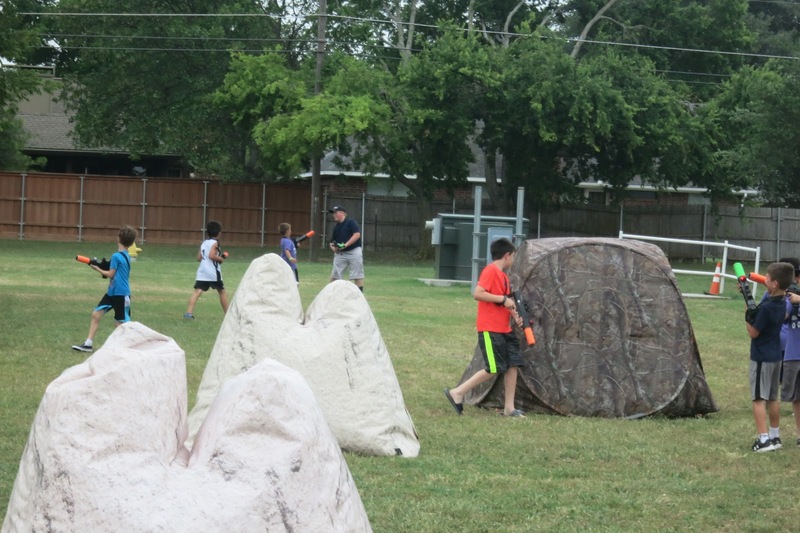 He answered many requests to change games and show the kids how to play if they didn't know how. It's a dream come true for kids this age. However, we didn't stop there. 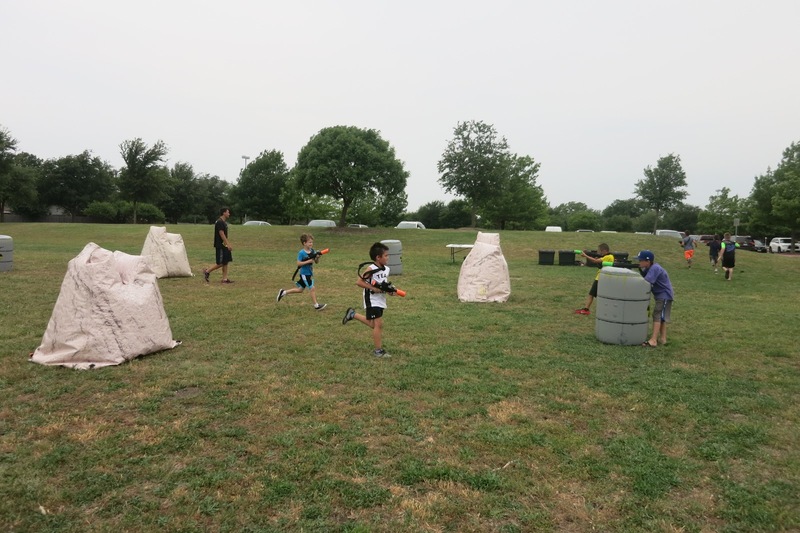 Since the location of the party was at a nearby park with lots of green space we chose to add laser tag. And I am so glad we did, this was the boys favorite part. While the boys were in the game truck another employee set up the laser tag course complete with tents, inflatable barrels and barriers to hide behind.The laser tag host also ran the games and was a great sport with all the boys. I was worried they would get bored and not want to play an hour of laser tag, but I was wrong. 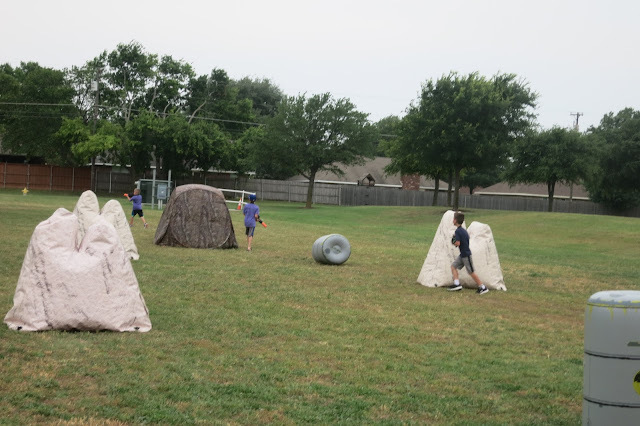 The host mixed it up with different laser tag games to play so they weren't going after the same people the whole time. Thankfully, I had pizza and cupcakes to draw them away from this once our hour was up. I rented a covered pavilion for a very nominal fee with bathrooms just in case it rained. However, this covered pavilion did nothing to combat my arch nemesis ...wind...again...the balloons, my decorations and centerpieces didn't stand a chance. I had green and black balloons, table cloths, napkins, and diy centerpieces that I wasn't able to use because it was so darn windy. While I was disappointed, the boys could of cared less. 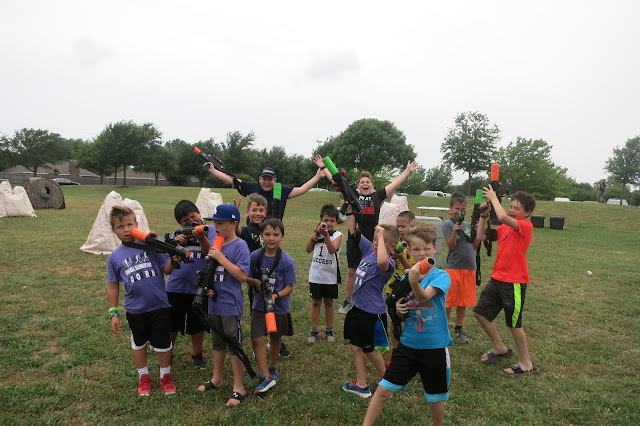 They had such a great time with their friends running around for two hours straight. They happily gobbled up pizza, water, and cupcakes and went on their way. This was a super easy party to plan and host. The Game Truck company took care of everything except the food. This is just the best! 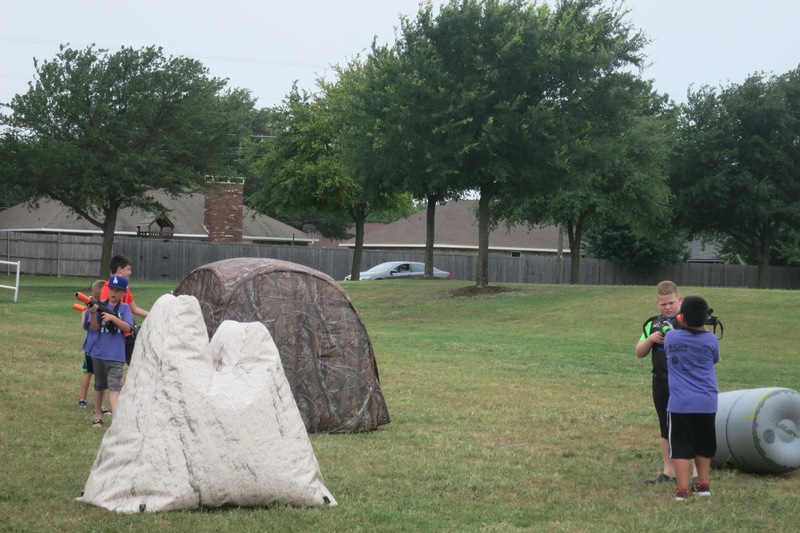 Perfect activity to keep those boys busy and active! I love the game controllers in the centerpieces! Amazing blog about games its relly nice thought Visit this . The data underneath accentuates visit here on general points you ought to be acquainted with while choosing the best gaming CPU for your requirements. The Games Console are one of the marvels of most recent innovation.bloxorz The amusement designers can really picture and complete the unending wants of the gamers.